The Mural Over the Entrance to 1133: Who Are Those Three Women? The Mural Over the Entrance to 1133: Part I — Who Are Those Three Women? The mural that greets visitors to 1133 is from the American Renaissance period. From 1876 to 1917, this classical revival art movement celebrated civic virtue with a profusion of public murals presenting Greek allegory. The St. James mural was painted by Arthur Brounet, a nationally famous muralist of the Golden Age whom we’ll cover in a future article. His work appeared in fine homes, theatres, and civic buildings, and commercial structures in New York City and beyond. 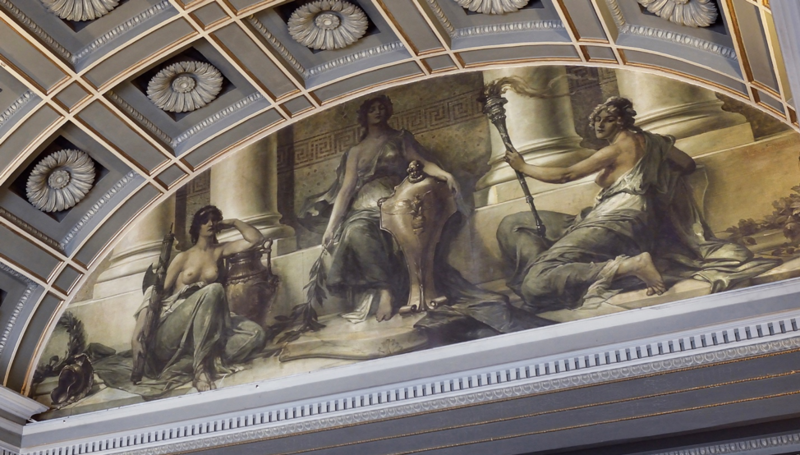 The St. James mural features three beautiful goddesses stunningly arrayed in a strong classically balanced composition. For all its formal symmetry and balance, the mural has tremendous movement and energy created by the limbs and garments of its three imposing figures. In the center is the Greek Goddess Athena (known to the Romans as Minerva) flanked by two virginal attendants, possibly the vestal virgins. Athena/Minerva is associated with a shield, owl, olive tree/branch (while there are no owls in the mural, it is interesting that there are so many on the exterior of the building). Athena is the patroness of learning and wisdom, guardian of cities, and a powerful goddess of war and peace. Athena is also the patroness of arts and crafts which is fitting because the St. James was, from the outset, meant to be a building for architects and other creative and building trades professionals. In fact, Bruce Price, the architect of the St. James, and Daniel Burnham, the architect of the Flatiron Building and the famous Chicago Columbia Exposition, had offices in 1133 Broadway. The figure on the left holds the fasces, a cylindrical bundle of wooden rods out of which protrudes the head of an ax. The fasces is a symbol of power and unity as well as magisterial and regal authority. Unfortunately, it became a beloved symbol of “fascists,” who derived their name from this once-respected classical symbol of strength. With this imagery, the figure on the right represents a guardian of hearth and domestic life. On the right, the figure carrying the flame is a symbol of life, the undying fire. The resulting composition when taken together was probably meant to represent the best values of the ever-victorious America — a fine fusion of commerce, culture, and that uniquely American phenomenon, domestic excellence. In 1896, virtually any well-educated person would have a good idea of who these women were and would intuit the mural’s meaning. Today, it may not be so clear, but there is still a lesson for us in the three fabulously beautiful portraits. So the next time you arrive for work, look up, because a century later the mural like all art, can lift our spirits and inspire us to achieve more. The goddesses might also calm you: Have you ever seen such serenity, confidence and strength?